These are seriously good - Easy peasy & healthy too! 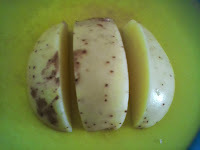 I usually work on this proportion: 1 potato per person - so it's easy to for me decide how many spuds to slice up. 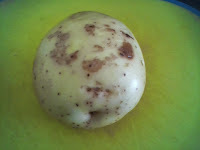 If there are any left overs they are delicious the next day with breakfast - a sort of chunky hash brown. My husband loves them with (soft yolk) easy-over eggs. I always buy WASHED POTATOES - life is too damn short to peel potatoes and, too be honest, I just can't be bothered with that unnecessary chore any more! Besides, chunky chips are nicer with the skin on. 1. 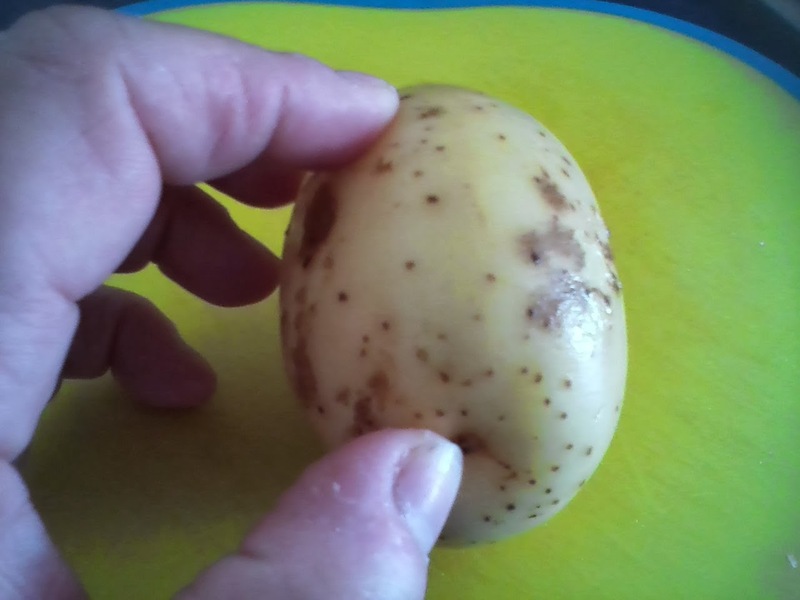 Scrub the potatoes lightly but thoroughly - even washed potatoes need a good clean. No need to dry them properly. 2. 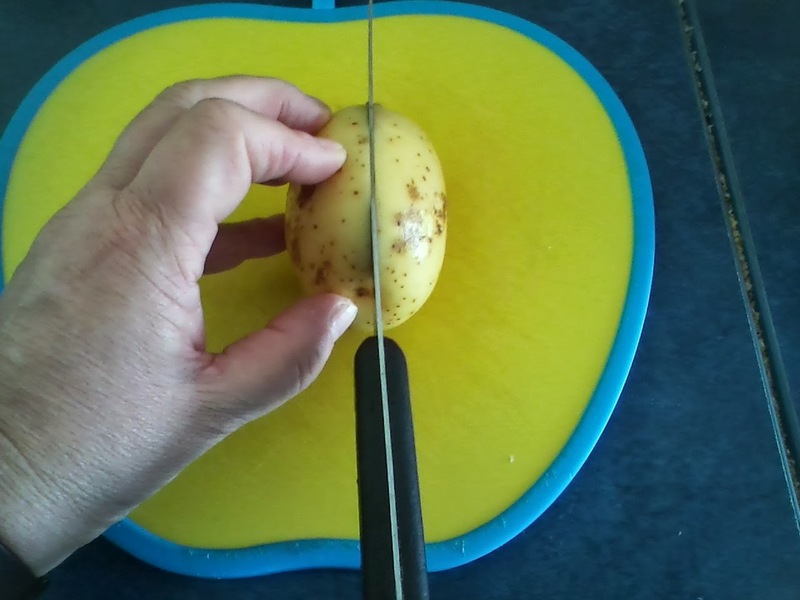 Hold the potato lengthways - You want to cut the potato into nice long wedges. 3.a End up with this - ready to cut into wedges. 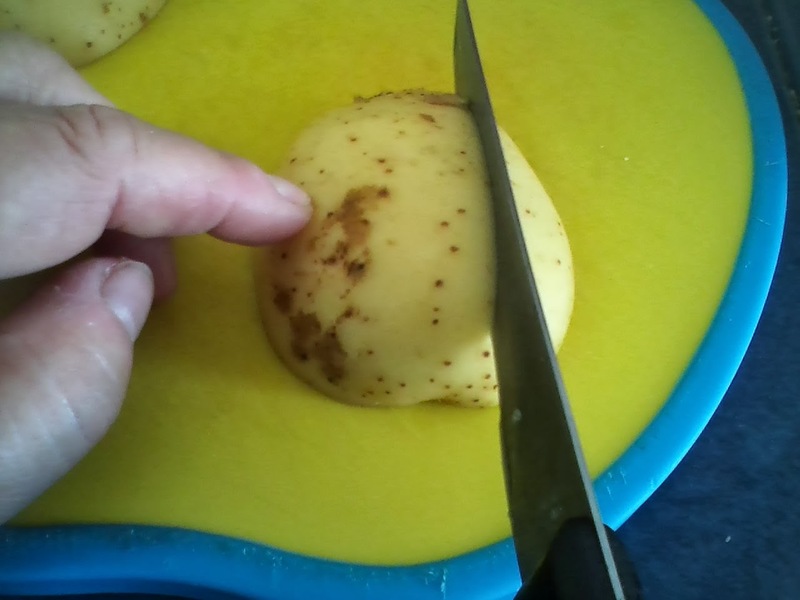 4.a Cut the potato half into 3 chunky wedges - Use your judgement on this. If the potato is smaller cut it into 2 - if larger cut into more. But remember you are making chunky chips so you want a decent size. 4.b Here are the 3 wedges from the one half. Repeat this process until you have the desired amount of chips required for your family. I keep the Chinese takeaway ones for this - they are just the right size. 5. Microwave on high for about 5 minutes - check the wedges with a fork. They should be just tender - the fork should go into the wedge easily. 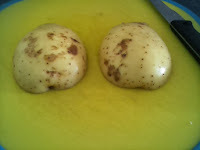 They are now cooked - but not finished off yet. TIP***Before you put wedges into the microwave to cook put a fry pan on to heat up - medium -hot heat level same as for steak - but it needs to be well preheated so will take a good five minutes. 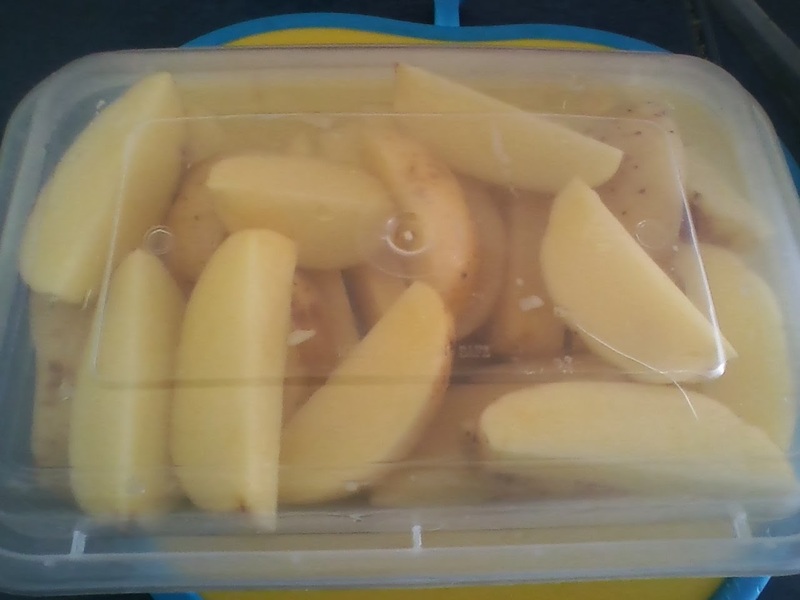 I cook these wedges alongside the Perfect Steak and an egg. An all time favourite treat for my husband, he really loves this for dinner! I use Dots Cooking Spray then once the pan is hot place the wedges in to brown them on each side. 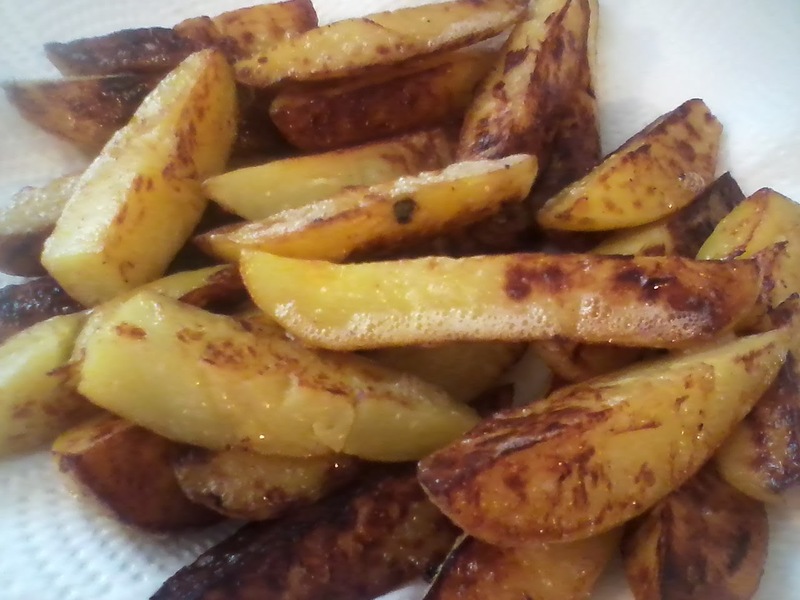 These take about a minute on each side and they end up like mini roasted potatoes - in the form of easy to eat, finger-licking, delicious wedges! Season with salt and pepper to taste and serve. 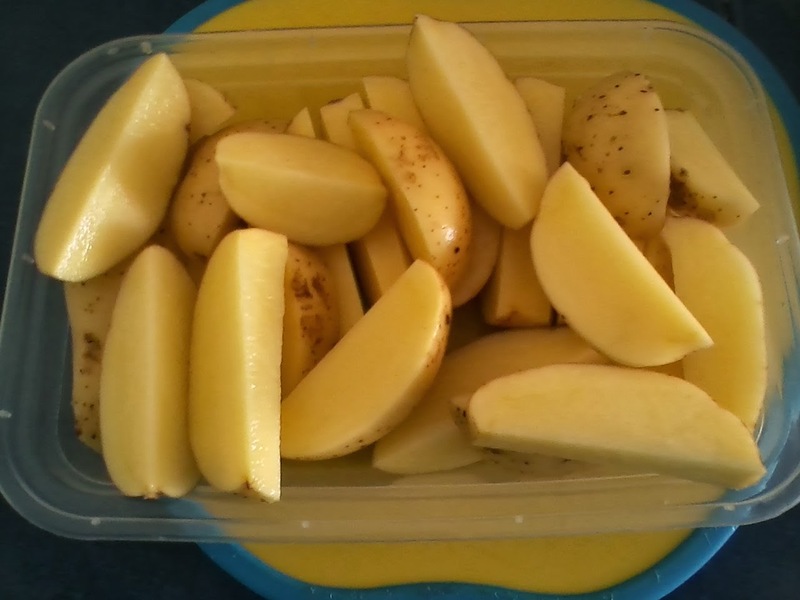 Mmm...wedges - what would you serve with them..?